Always show full-help: Always display the help system with header, footer and navigation panels. Navigation bar: Show or hide the navigation bar. See 6 in the Screenshot and quick reference for Web Help – Default template. See 6 in the Screenshot and quick reference for Web Help – OfficeStyle template. Navigation: Icons/buttons in the navigation bar. Fixed: The navigation bar should scroll with the topic content or not. Breadcrumbs: Show or hide the breadcrumbs. 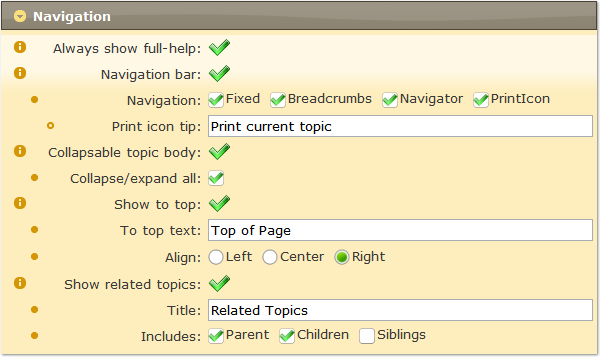 Navigator: Show or hide the buttons: previous topic, parent topic, next topic. PrintIcon: Show or hide the print icon. Collapsible topic body: The topic content is collapsible or not. See 7 in the Screenshot and quick reference for Web Help – Default template. See 7 in the Screenshot and quick reference for Web Help – OfficeStyle template. Collapse/expand all: Show or hide the Collapse All/Expand All buttons in the navigation bar. Show to top: Show or hide the “Go Top of Page” buttons. See 8 in the Screenshot and quick reference for Web Help – Default template. See 8 in the Screenshot and quick reference for Web Help – OfficeStyle template. To top text: The text for “Go Top of Page” buttons. Align: The alignment of “Go Top of Page” buttons, related to the topic body. Show related topics: Show related topics or not. See 9 in the Screenshot and quick reference for Web Help – Default template. See 9 in the Screenshot and quick reference for Web Help – OfficeStyle template. Title: The title for the Related Topics section. Includes: What topics should be included in the related topics section. Parent: Includes the parent topic in the related topics. Children: Includes the child topics in the related topics. Siblings: Includes the sibling topics in the related topics.